This is the first game in the inFAMOUS series. For other games in the series see the inFAMOUS category. 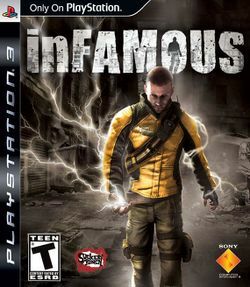 inFAMOUS is a sandbox-style video game for the PlayStation 3 video game console. It was developed by Sucker Punch Productions and was published by Sony Computer Entertainment. The game was released on May 26, 2009 in North America, May 29, 2009 in Europe, and was released on June 4, 2009 in Australia. inFAMOUS is the story of Cole MacGrath, a bike messenger given an assignment to deliver a package that is secretly a bomb. Cole survives the massive explosion and develops electricity-based powers. Soon, Cole discovers that his city has fallen into chaos under the rule of gangs and factions and must fight back against them to restore order. This page was last edited on 17 March 2016, at 17:39.